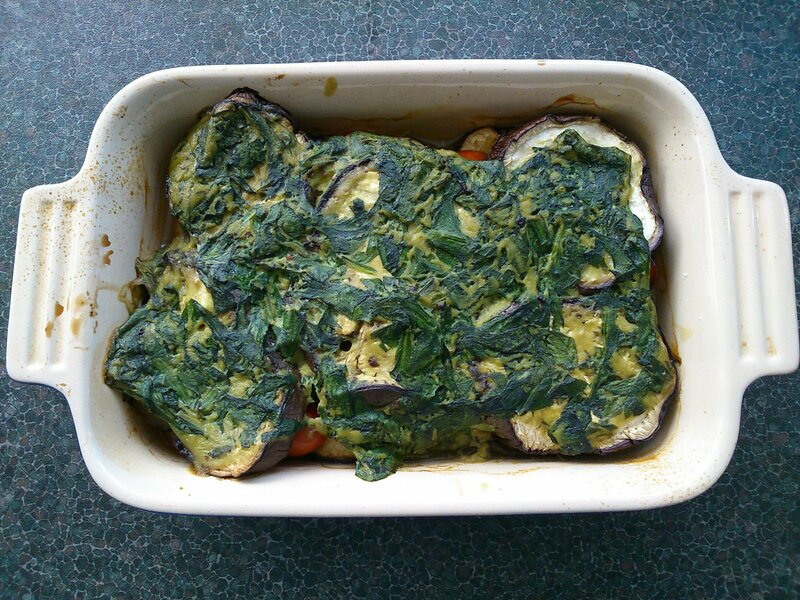 Here’s another one of my forays into cooking aubergine with very little or no oil. It worked wonderfully in this chinese style recipe and I wanted to try a different method for an Italian inspired layered dish. Baking the sliced aubergine weighted down with a heavy dish before assembling the bake worked really well, the aubergine was beautifully soft with no oil used at all! I’ve simply layered it with cherry tomatoes, and a quick sauce made with soy milk, spinach and basil. Next make the sauce. Heat the oil in a small saucepan on a medium heat, and stir in the rice flour. It’ll probably go lumpy, but cook it for one minute, stirring all the time. Add the soy milk a little at a time, the sauce will be fairly thin. Add the spinach, basil, and some salt and pepper and stir until the spinach is well wilted. In a small baking dish, arrange half of the tomatoes, cut side down. Layer on half of the aubergine and a little salt and pepper, followed by half of the sauce. Repeat with the rest of the ingredients. Bake for 30 minutes until the sauce on top has set and the vegetables are hot all the way through. When mine came out of the oven there was quite a lot of juice in the dish, but I left it to cool to room temperature and the aubergines soaked up all the lovely sauce, yum! So I’d recommend serving it cooled a little rather than right out of the oven.